An IAM contingent joined hundreds of workers’ advocates in rallying against the job-killing Trans-Pacific Partnership trade deal. 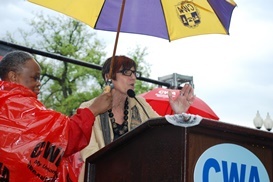 A springtime downpour in Washington, DC didn’t dampen the spirits of IAM members and other activists from rallying against the Trans-Pacific Partnership (TPP), another free trade deal that promises job growth but instead exports thousands of U.S. jobs to low-wage countries. “The people being soaked are the American public,” Rep. Sandy Levin (D-MI) told the crowd gathered near the Capitol. 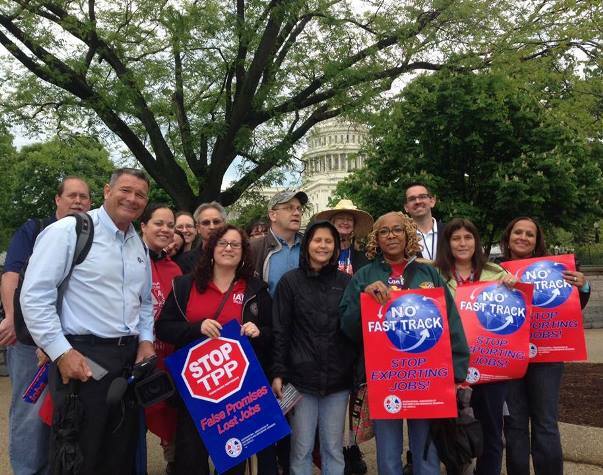 Click here to watch the new Machinists News Network video, “Machinsts Rally Against TPP and Fast Track.” Click here to see photos from the rally. TPP includes the United States and 11 other countries, including infamous workers’ rights violators like Vietnam and Brunei. It is being discussed in secret, with no oversight by the public, Congress or the media. To make matters worse, trade negotiators are seeking to “fast track” TPP, meaning Congress would only be able to vote yes or no on the full agreement. Lawmakers would not be able to amend any flaws in the bill. Rep. Rosa DeLauro (D-CT), who is co-leading a group of more than 130 House members seeking more transparency in trade negotiations, said TPP threatens the American Dream. Speakers included Reps. Levin, DeLauro, Keith Ellison (D-MN), Mike Michaud (D-ME), Mark Pocan (D-WI) and Jan Schakowsky (D-IL). IAM International President Tom Buffenbarger, AFL-CIO Secretary-Treasurer Elizabeth Shuler and AFL-CIO Executive Vice President Tefere Gebre were also in attendance. Click here to tell Congress we want fair trade, not free trade, in the TPP.